SAN JOSE, CA. — Former 49ers Wide Receiver, Jerry Rice, was the keynote speaker on May 3 at the annual homecoming of Palmer College of Chiropractic, West Campus in San Jose, Calif. Rice, who is a spokesperson for the Foundation for Chiropractic Progress (F4CP), spoke to attendees about his chiropractic experience, as well as partook in a photo session and visited with participants of the Athletic TIPS™ certification seminar. 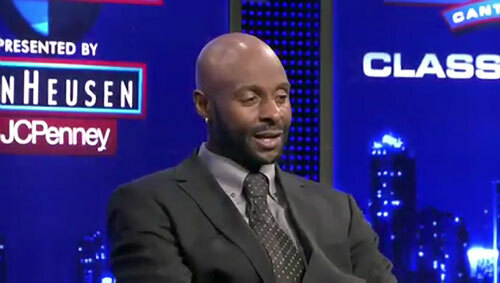 Photo shows former 49ers wide receiver, Jerry Rice, speaking during 2010 Hall of Fame interview. Jerry Rice is a former NFL wide receiver who played 20 seasons. He won three Super Bowl rings with the San Francisco 49ers and an AFC Championship with the Oakland Raiders. He was selected for induction in the Pro Football Hall of Fame class of 2010 in his first year of eligibility. If you would like to book football speakers or athletes like Jerry Rice for a speaking engagement, autograph signing, endorsement or special event, contact Jerry Rice’s booking agent for appearance and speaker fees at Sports Speakers 360. For booking agent and appearance fee information on how to hire San Francisco 49ers players for appearances, call 1.855.303.5450.